Thinking about Pasar Ramadhan in Malaysia, the first thing that came across in my mind was Tepung Pelita.. In Ireland I first tasted it at Kak Ina's in Lucan. It was really delicious. Recently I found the recipe in myresipi.com. So, I tried the recipe yesterday. Alhamdulillah it was ok for a first timer. 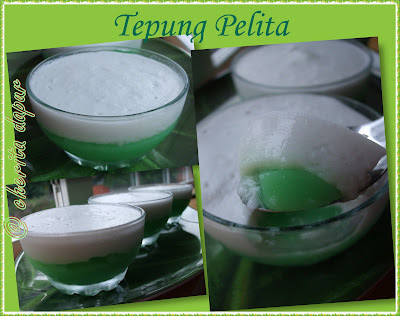 hehehe.. it is better to used pandan juice from pandan leaves rather than pandan paste... because the taste was not truly pandan. It's best to eat chilled. Click here for the recipe. Enjoy!